a hidden gem. don't let the frontage fool you ... i wrongly assumed it would be heaving with drunks given the central location. what i found was an excellent basement pub with a good crowd, comfortable booths, pleasant staff and what looked to be a decent menu, although we'd already eaten so didn't sample any of the food. 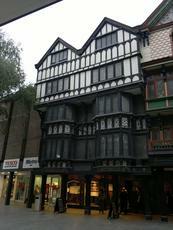 certainly a pub to note if you are in exeter. This is a very good pub indeed. Situated right in the city centre you would expect it to be heaving and full of idiots on a saturday night. Not at all, me and my brother have had some great nights in this pub. It's very good for a conversation as the music is quiet and relaxing. Also has a big food menu.